My sweet chelsea...i will always miss my whisker face. You are with the angels now! I remember the day mom and dad brought you home, You were my beloved childhood dog. You were so cute and funny. We didn't trim your hair until you were practically a ball of fluff. Do not worry little sister, there are no thunderstorms in heaven in fact i bet the sun is shining right now on you. I feel so sorry for you. I know you are still hurting for your angel. I pray it gets better with time. or tear/drop in your heat. and that you did all you could for her. I said a prayer for her and do for you two. I am sorry for your loss. 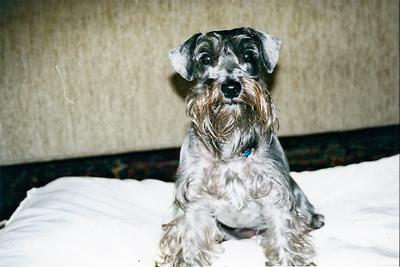 My childhood Schnauzer was also named Chelsea (and another named Truffles)- your dog is at peace and she was truly loved during her time on earth. It's so sad to lose a beloved pet and best friend. My heart aches for you in the time of your loss. They live on in our hearts through memories.